UC Irvine doctoral candidate Sumner Norman wears an EEG cap that figures prominently in his robotics research to help stroke victims. Blame it on the movies and television, but people tend to think of robots as tireless factory workers or as soulless automatons bent on destruction. For UC Irvine’s Sumner Norman, they’re all about healing and rehabilitation. The fifth-year doctoral candidate in mechanical & aerospace engineering studies robotics-based therapies to help stroke victims. Norman belongs to the biorobotics lab group headed by David Reinkensmeyer, UC Irvine professor of biomedical engineering, mechanical & aerospace engineering, and anatomy & neurobiology. Members develop robotic and mechanical devices to help people recover from stroke- or accident-induced neurological damage. The grad student says he’s focused on aiding victims of stroke because it’s the leading cause of disability in the United States. “There are so many of them, and as our population continues to get older, the numbers are only going to go up,” says Norman, who will be representing UC Irvine and The Henry Samueli School of Engineering on Graduate Research Advocacy Day in Sacramento on April 19. Robotics developed in the UC Irvine lab provide motion assistance and amplification to stroke victims. Another approach uses technologies to join patients with a computer so they can play immersive, motivating video games. To track therapeutic progress, the systems record and store data that can be shared with doctors and therapists. 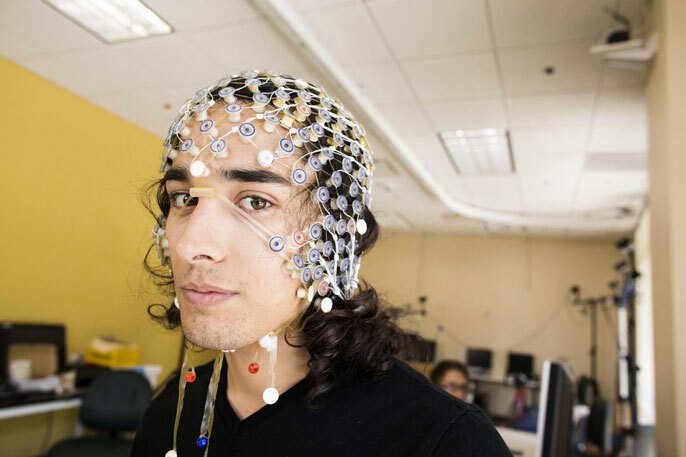 His core project is the creation of a computer interface that patients wear on their heads. The electroencephalogram device searches for brain states that are correlated with movement success. According to the grad student, there are parts of the brain that are capable of recovery poststroke. The objective is to use the device to train these regions to perform tasks previously handled by now-damaged areas. He notes that while many robotics researchers are focused on producing artificial limbs for amputees, his work to help stroke victims presents some unique challenges. “Rather than a replacement, it’s a rehabilitation,” Norman says. “It’s actually a harder problem, because when someone’s lost an arm, you can build a new one to go in its place. Someone who’s had a stroke still has an arm and doesn’t want to wear something robotic all the time.